At only 110 km wide at the narrowest point and rising up to nearly 4 km at the highest point, Costa Rica is diverse in flora, wildlife, climate and activities. 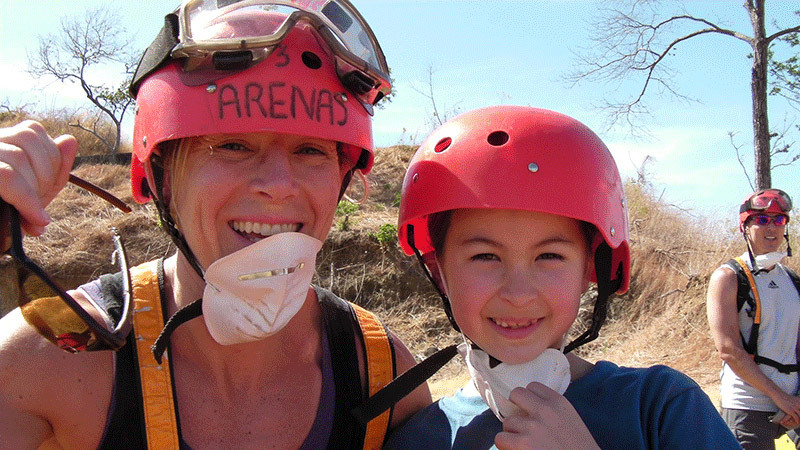 Travelling as a family of four with two children (ages 11 and 8), we were looking for something out of the norm. It had been recommended to us to fly in and out of Liberia instead of the bustling capital of San Jose. Liberia has a small airport and is much easier to get in and out of, but the food prices are astronomical! Although the major areas aren’t too far from each other, many of the roads (especially going inland) are windy and bumpy, leading to lengthy, motion sickness-inducing rides. My family used shuttle transfers and, after being on the roads and seeing what driving conditions were like, we were glad we didn’t rent a car. Our first stop was the cloud forest town of Monteverde. It’s called a cloud forest for a reason–the temperature was cooler than we had expected, meaning hoodies were well-used. Ziplining was the adventure of choice for us! The tour we picked led us high into the mountains where we crossed several suspension bridges and 10 different ziplines. At over 750 metres, the longest of the 10 ziplines takes over a minute to traverse! 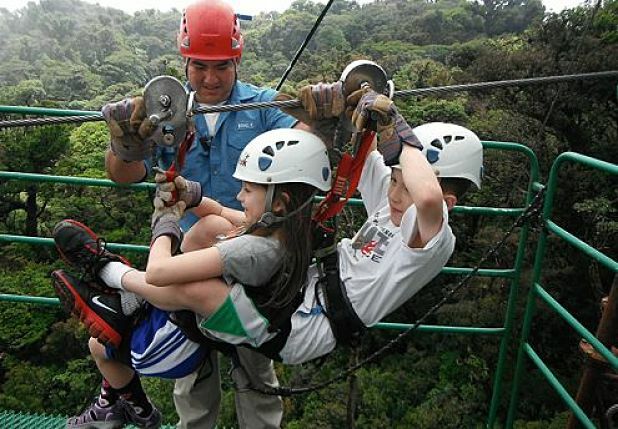 Sky Trek’s Canopy Tour was a great experience that my whole family loved. Here are my kids, all suited up to zipline! Our next destination was Manuel Antonio. We stayed at a small hotel with an outdoor restaurant overlooking the beach. During most meals, the dining area and pool were surrounded by iguanas and geckos, but the highlight was the many white-faced capuchin monkeys that would steal bananas from the buffet table. Watching them peel and eat the bananas just a few metres away was amazing to watch. Manuel Antonio is known for spectacular beaches and its national park – neither of which disappointed. 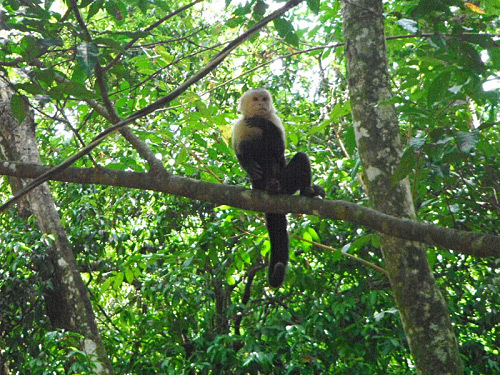 Our guided tour of Manuel Antonio National Park allowed us to see more of the white-faced capuchin monkeys as well as howler monkeys, two and three toed sloths, and a variety of birds, spiders and frogs. A short taxi ride took us up to a restaurant overlooking the water where the nearby forest was full of howler monkeys whose distinct howling could be heard miles away. Next on the agenda was our hotel in La Fortuna, which gave us an unforgettable view of the active Arenal Volcano. An educational hiking tour of the surrounding area included dinner at the luxurious Tabacon Hot Springs. This eco-friendly and carbon-neutral resort has several waterfalls and pools within a natural and lush environment. Our kids loved the hot waterslide and a swim-up bar where they could get cold water and popcorn. Our final stop was the beach town of Tamarindo. Arriving in the “americanized” Tamarindo was a shock to our systems! Lots of shops and restaurants with high prices cover the crowded main strip. After a day or two to adjust, we found ourselves thoroughly enjoying the beaches of Tamarindo; although it was too hot to stand barefoot in the sand by 10 AM! We had a blast taking family surfing lessons. It was a first for all of us, and I have to admit that the kids dominated the adults! Our final adventure was an ATV tour; it took us up into the surrounding hills, giving us incredible views of the coastline. Once down from the hills, we sped along the beaches and shallow water, the perfect end to another amazing tour. Throughout our time in Costa Rica, the people we met were very friendly and the local food was excellent. Kids might have some issues getting used to eating fried plantains with black beans and rice, but we also had our fill of pineapples and mangoes. Easily a 10 out of 10 for our family vacation and a destination we would love to travel to again!. Considering Costa Rica as your next destination? Come chat with us (@TuGoInsurance) on November 19, Tuesday at 10AM PST, as we talk about anything and everything about travelling to Costa Rica. Follow the conversation at #TravelShare! 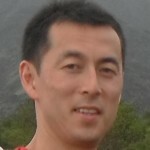 TuGo’s Cost Management Director, Taka, has been with us for over 18 years. 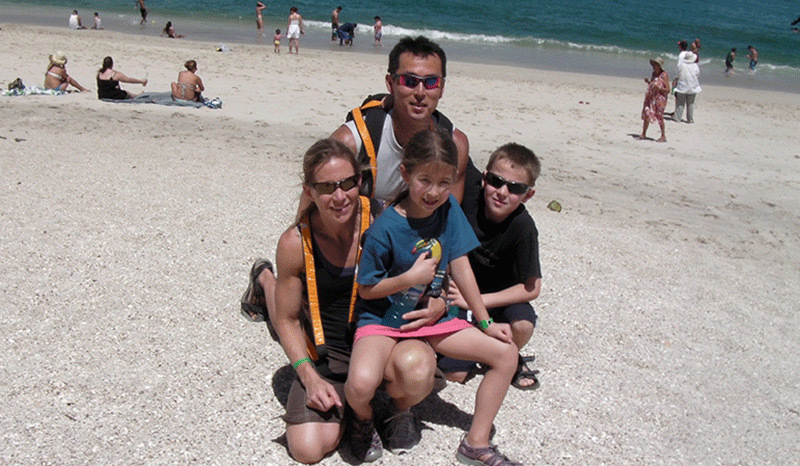 He and his family are constantly on the hunt for adventure, all over the world. So far, they’ve travelled to six different countries and counting!